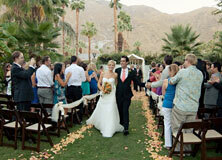 Casa de Monte Vista in Palm Springs is available for vacation rentals, weddings and ceremonies, filming and photoshoots, special events and corporate meetings. 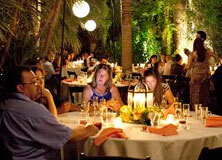 Complete with a “caterer ready” full kitchen, Casa de Monte Vista is a boutique hotel on a small estate in the historic Old Las Palmas neighborhood of Palm Springs. It has a covered patio with AC for dancing, guest casitas/private suites for elegant overnight stays, palatial grounds, lush landscaping and spectacular mountain views. Located just 6 blocks from downtown Palm Springs. Only two hours from Hollywood, Temecula Wine Country, North San Diego, Disneyland and Anaheim, Victorville, Big Bear and Anza Borrego Desert State Park, you should celebrate your time here in the famous neighborhood of Old Las Palmas near downtown Palm Springs. Casa de Monte Vista has individual casita suites with private entrances, as vacation rentals, or you can rent the entire house for limited stays to celebrate weddings, reunions, special events, corporate events and parties. The warm solar-powered saltwater pool, landscaped gardens and grounds are surrounded by tall privacy walls and gates for your private and quiet stay.